When I host a party (or even co-host) there is always a party favor, it does not matter is the party is for 5 year old little children or grown women. Who doesn't like a party favor? 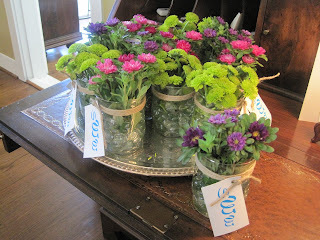 These particular party favors were for a birthday luncheon last week for a friend. Simple, age appropriate and adorable, plus they carried out the birthday girls monogram (we love that)! The glass container were purchased at the dollar store (yes, I said Dollar Store), I wrapped twine several times around each one and attached the Birthday girls monogram (that I printed on the computer on card stock paper, about $5.00 for a package of 100 sheets or more at Wal-Mart or Target). 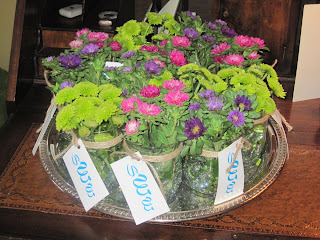 Each one was filled with clear glass flat rocks (marbles) and topped off with precious flowers. All set on top of a silver tray and ready for each guest. Ohhhhh, and you have such a special and delightful friend... Happy belated birthday, S! Wonderful ideas Tikaa - keep them coming!